The Vikings tore up the Saints on third down during Sunday’s 29-24 win, but Philadelphia's defense should present a much stiffer challenge. The Saints were one of the NFL’s worst third-down teams on both sides of the ball, and that was before Stefon Diggs’ miraculous 61-yard, walk-off touchdown that just so happened to be on third-and-10 in the closing seconds. Perhaps a trip to the Super Bowl will also be decided by third downs. Minnesota’s offense is preparing this week for the Eagles’ No. 2 third-down defense, bested only by the group quarterback Case Keenum practices against every week. Four of the NFL’s top five scoring defenses remain in conference championship weekend and it’s no coincidence. The Eagles have the freshest defense by way of third- and fourth-down success, averaging an NFL-low 27 minutes and 19 seconds on the field. The Vikings tore up the Saints on third down during Sunday’s 29-24 win, converting 10 of 17, including 5 of 7 while building the 17-0 lead. Let’s take a look at what has made the Vikings offense successful on third downs this season, and the challenge ahead in Philadelphia during Sunday’s NFC title game. The Eagles appeared to run plenty of man-to-man coverage on third-and-medium in the 15-10 NFC Divisional playoff win against the Falcons. That works especially well when a fresh defensive line can generate quick pressure, like the Eagles did on Matt Ryan. Two of the three Eagles sacks on Ryan came in the second half, starting with this third-and-5 below. Eagles linebacker Nigel Bradham is too much for Devonta Freeman on this blitz, timed just as Falcons center Alex Mack executes a slide protection toward Eagles defensive lineman Fletcher Cox, who had the first sack on Ryan in the second quarter. Click here if this video is not displayed. The NFL’s best third-down offense, the Falcons, had marginal success vs. the Eagles — some of which came on man-beating concepts that should look familiar to Vikings fans. Atlanta converted only 4 of 13 third downs in Philadelphia, including this third-and-5 below. Freeman motions out of the backfield and Jenkins follows, confirming to Ryan the Eagles’ man-to-man coverage. Between defensive linemen Brandon Graham (#55) and Cox (#91), the Eagles put a lot of their firepower inside on this third down. Ryan gets hot feet and flees before finding Mohamad Sanu for 17 yards. On the wide view, watch Falcons tight end Austin Hooper set the pick for Sanu on the bottom of the screen. The Vikings converted 44 percent of third downs during the regular season, and this ‘Hi-Lo Mesh’ concept with a wheel route continues to pay dividends under Pat Shurmur. You’ll recognize it from big gains throughout the past few games. Thanks to former NFL safety Matt Bowen for pointing out this concept was a favorite of Chip Kelly’s during his time with the Eagles. Shurmur likely picked this one up while working under Kelly from 2013-2015. Against the Saints’ man-to-man coverage, Laquon Treadwell and Adam Thielen run in-breaking routes that help set picks to free Stefon Diggs underneath on a crosser. Jerick McKinnon helps carry the linebacker out of the picture with a wheel route to the right. The Vikings offensive line will have its hands full against an Eagles front that last year laid 17 hits on Sam Bradford. 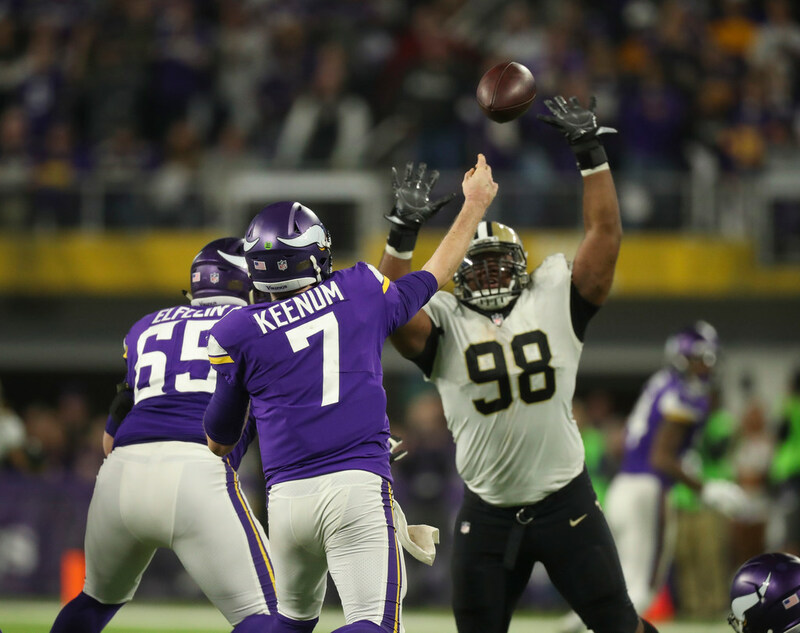 This year’s improved line will need to do better after the Saints hit quarterback Case Keenum eight times (two sacks) in Sunday’s win. Allowing quick pressure, like on this third-and-4 below, is the wrong idea. Matchup to watch: Will Jeffery get open or will Rhodes close him down?